Hello! After a spectacularly sunny Tuesday, our forecast turned slightly cooler and grayer. And there are more raindrops in the days to come, with a particularly significant storm system between late Friday and early Saturday. But no day will be a total washout, and you'll find glimmers of delightful springtime weather along the way. As expected, the sky spit on us overnight, with some light showers passing through New Jersey. I am still seeing light sprinkles on radar on this Wednesday morning, so don't be surprised if you feel or see a few raindrops. For most of Wednesday, we'll see a mix of sun and clouds (ranging from partly sunny to mostly cloudy). With a light on-shore component to the wind, thermometers cool down slightly. Whereas Tuesday was in the mid 60s, we'll be limited to around 60 degrees for a high temp on Wednesday afternoon. Another batch of scattered showers is forecast to arrive Wednesday evening, probably not until after 10 p.m. Again, just a little bit of rain — it will be hit-or-miss (scattered) and light (showers). Overnight low temperatures will be comfortably cool, in the mid to upper 40s. Those showers will probably linger for a bit Thursday morning. After noon, we'll just deal with clouds and a south-southeast breeze. High temperatures will warm a bit, ranging from the lower 60s in North Jersey to lower 70s in South Jersey. Friday will start fairly warm and humid, with lots of clouds overhead. I wouldn't be surprised to see a shower starting around midday Friday. 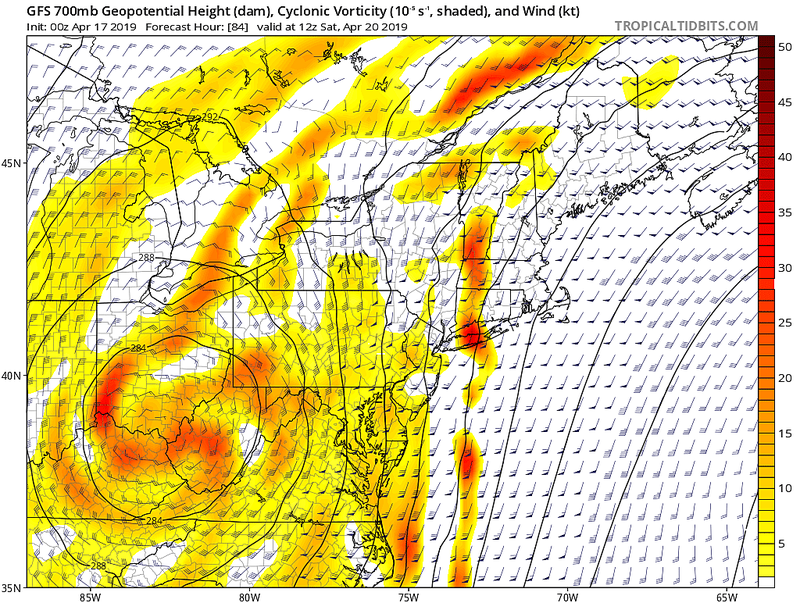 And then a pretty significant storm system (a deepening area of low pressure) arrives with rain and wind. Model solutions are in marginal disagreement about the start time of steady rain. 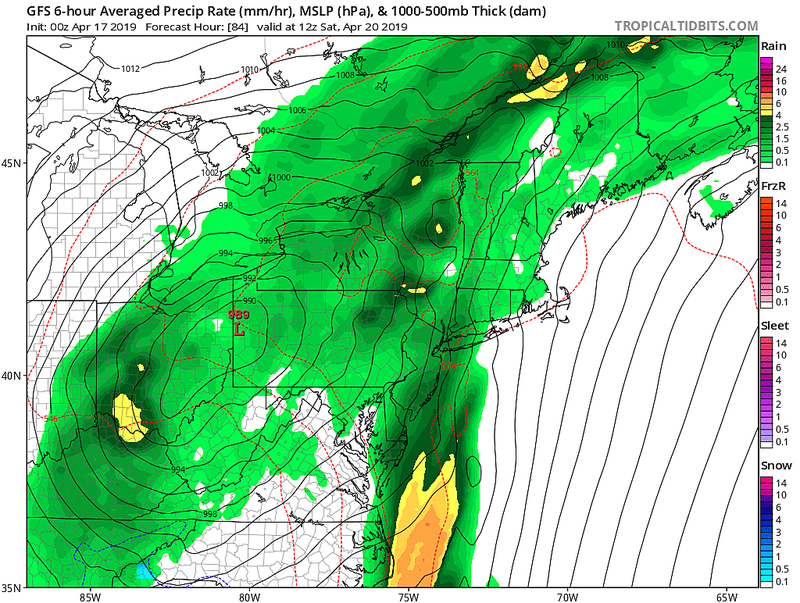 The GFS says raindrops arrive as early as Friday afternoon. Meanwhile, the NAM and Euro models are leaning toward wet weather holding off until late Friday night. At the moment, it looks like New Jersey will just barely miss the heaviest deluge of rain, which is forecast to remain just to our east over Pennsylvania. (And I do mean deluge, with a swath of 2+ inches of rain possible!) Don't misread me — we're still going to get soaked, with an inch of rainfall a good bet across New Jersey (especially to the south). And it's going to be windy, with potential gusts to 40 mph. However, I am confident that most of the upcoming holiday weekend will be fine. The periodic heavy, steady rain will hopefully wrap-up by midday Saturday, and we may even get the sun peeking out Saturday afternoon. High temperatures will be comfortably mild, generally in the mid to upper 60s. Winds may stay elevated, in the "breezy" to "windy" range. A few showers are possible for Easter Sunday morning too. (I'm sure the Easter Bunny is planning to hide eggs for the kiddies indoors, just in case.) But once again, it won't be a washout, as clearing skies and pleasant temperatures in the 60s take over for Sunday afternoon. The best-looking weather day in this forecast is Monday, thanks to a combination of sunshine and warming temperatures. I'm calling for highs mainly in the mid 70s — 80 degrees is a possibility!